The news keeps getting better for NDP senior Jake Smith. Last week he was named Gatorade's Arizona Player of the Year. Out of the 51 (50 states, plus District of Columbia) state players of the year, Smith was named the Gatorade National Football Player of the Year, putting him in the same company as Payton Manning and Emmitt Smith. "Jake works hard and he doesn't take his natural talent for granted," said NDP varsity head coach George Prelock. "He will stay after practice 30 or 40 minutes longer just to work with our quarterbacks. He loves to win." The announcement was made in the NDP weight room on Dec. 11, as Smith was starting his last class of the day. 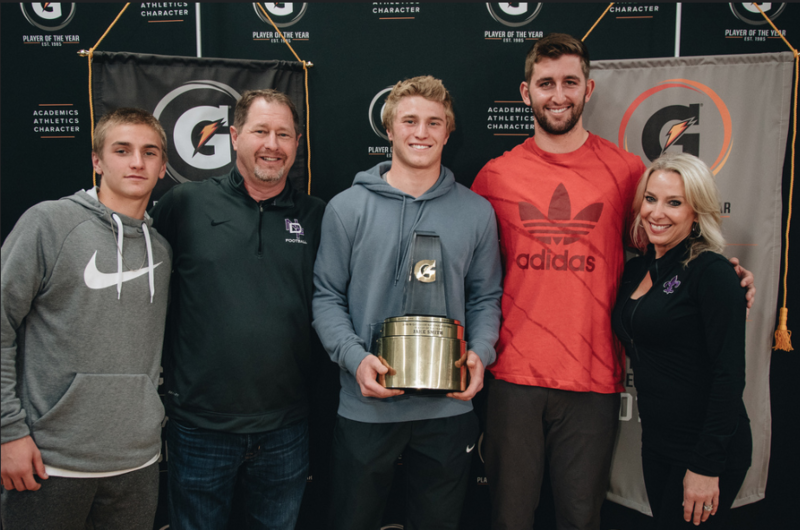 Arizona Cardinals quarterback Josh Rosen came to campus to present Jake with the and National Player of the Year trophy. Surrounded by teammates, coaches, family and media, Smith was surprised and a little speechless at the announcement. "Oh wow! I don't know what to say, except thank you to my coaches and my parents and all my friends and teammates," he said, in the crowded weight room.